More appearances announced in the Bay Area and Phoenix! Come game with us in May and June! We're looking forward to showing you our new and upcoming games! In January 2013, we released Jupiter Deep, our cooperative robot rescue game. Now a year and a half later, it has found a new home with Twilight Creations (the publisher that brought you Zombies!!!) under its new name, Jupiter Rescue, and now includes over 100 figures, new art, and new challenge modes! We hope you'll look for it at your local game store in May! A new year of Whirling Derby fun! It's a new year, and we have some great games in the hopper that we can't wait to share with you! First up, Blazing Spuds! A fast-paced dice rolling game that fits in your pocket, this game comes with 40 dice and a whole lot of fun! Roll and match your dice to create big combos, or use your cards to strategically target other players and load them down. The first player to get rid of all their dice wins! See more details about it and order it from The Game Crafter. The latest news is always on Facebook, Google+ or Twitter. Keep an eye out for more announcements and sneak peeks of our upcoming games! 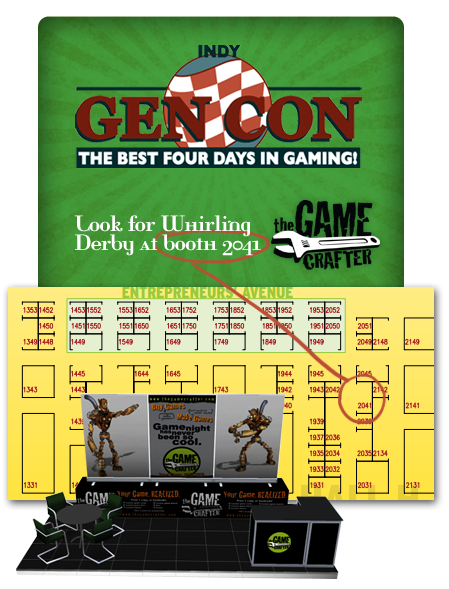 Whirling Derby will be at Gen Con 2013! Are you going to Gen Con 2013? 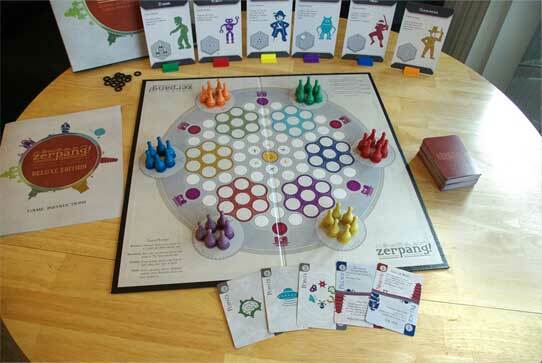 Be sure to stop by The Game Crafter's booth (#1931) on Saturday from 10am-2pm to see the deluxe edition of Zerpang! in action, meet Mark and Christina, and get yourself an awesome button! And follow us on Facebook, Google+ or Twitter for exciting announcements and news! Give us a shout on Facebook, Google+ or Twitter if you're going to be there! Game on, friends! 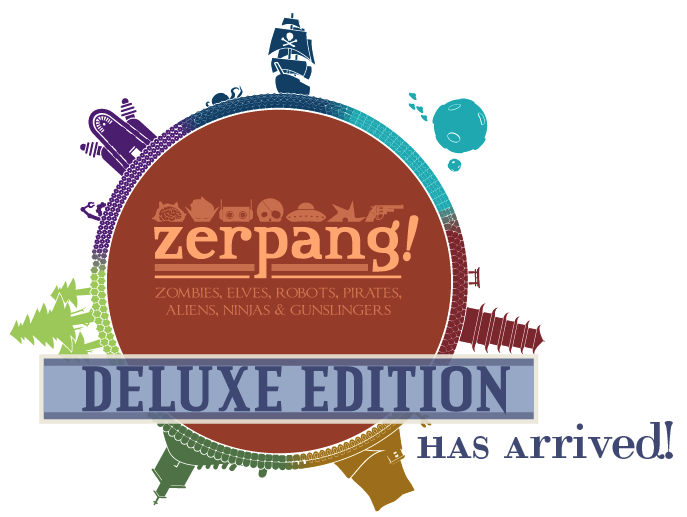 We're excited to announce the Deluxe Edition of Zerpang! (that's Zombies, Elves, Robots, Pirates, Aliens, Ninjas and Gunslingers) is now available for purchase at TheGameCrafter.com. What's new in this edition? A rich folding board printed on 0.4" thick cardboard. This edition is ideal for a classy gift or to add to your collection! Check out more photos and info here. Though Gen Con was a month ago, we're still completely energized and amazed by the warm welcome and amazing people we met. 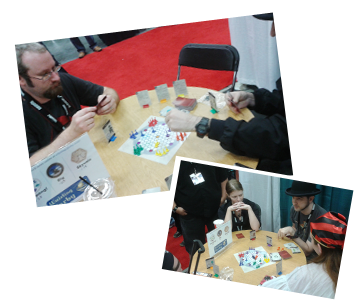 Thanks to all the Gen Con attendees and reviewers who stopped to demo Zerpang!, Rig, and Skyvale. And extra-special thanks to the Game Crafter crew for offering the opportunity to sit at their booth, as well as all the game designers who said hello and shared their games with us. We'd love to keep in touch with everyone we met, so throw us a shout on Facebook, @WhirlingDerby on Twitter, or our G+ Profile! We're also proud to announce a new site update on Whirling Derby: game comments! Just go to our Game Catalog, pick a game, and go to the comment section at the bottom to give it a star or tell us your experience. We look forward to hearing what you have to say! Be the first to play Whirling Derby's latest games at Gen Con 2012 in Indianapolis! 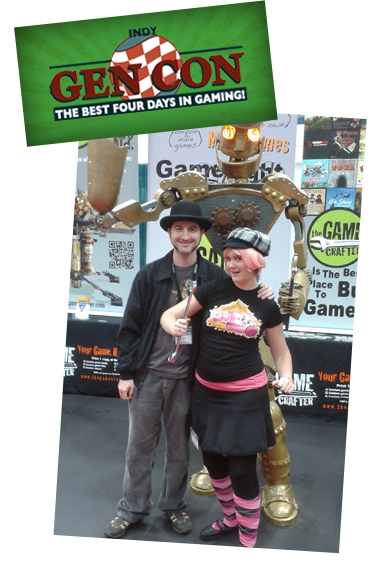 We'll be at The Game Crafter booth (#2041) all day on Friday, August 17th. Come play a round of Rig, Skyvale, or Zerpang! with us and take a copy home to share with all your friends. Stop on by if you plan to attend the convention!